INTRICARE is an interdisciplinary international consortium involving 4 leading academic institutions and 9 SME's from 6 countries. The ESR will engage in network-wide training events, public engagement activities and international collaboration through secondments, at industrial or academic partner institutions within the EU. The ESR aims to develop and employ state of the art hybrid molecular non-invasive imaging ((PET)-MRI) together with comprehensive multiparameter data analysis for the in-vivo assessment of “vulnerable” plaque. This will be approached in different vascular beds (carotids, coronaries) and multiscale view (animals, patients) to provide morphologic, functional and molecular information on the development and response to treatment of atherosclerosis. 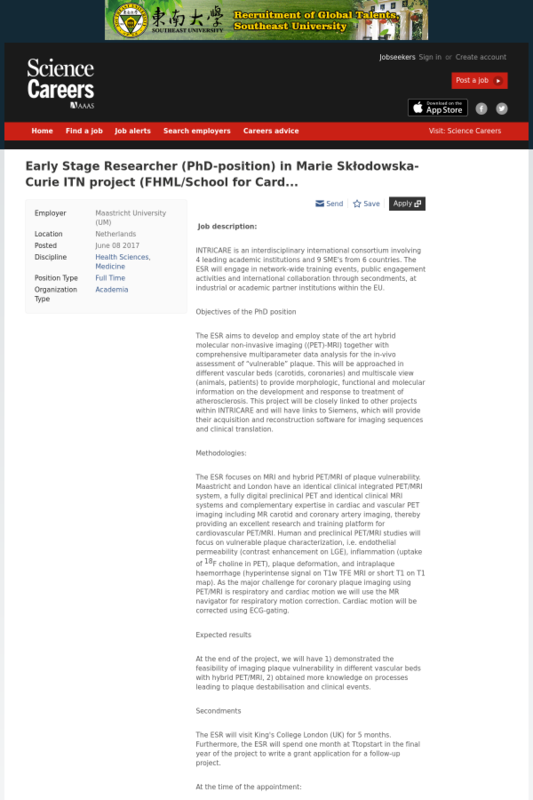 This project will be closely linked to other projects within INTRICARE and will have links to Siemens, which will provide their acquisition and reconstruction software for imaging sequences and clinical translation. The ESR focuses on MRI and hybrid PET/MRI of plaque vulnerability. Maastricht and London have an identical clinical integrated PET/MRI system, a fully digital preclinical PET and identical clinical MRI systems and complementary expertise in cardiac and vascular PET imaging including MR carotid and coronary artery imaging, thereby providing an excellent research and training platform for cardiovascular PET/MRI. Human and preclinical PET/MRI studies will focus on vulnerable plaque characterization, i.e. endothelial permeability (contrast enhancement on LGE), inflammation (uptake of 18F choline in PET), plaque deformation, and intraplaque haemorrhage (hyperintense signal on T1w TFE MRI or short T1 on T1 map). As the major challenge for coronary plaque imaging using PET/MRI is respiratory and cardiac motion we will use the MR navigator for respiratory motion correction. Cardiac motion will be corrected using ECG-gating. At the end of the project, we will have 1) demonstrated the feasibility of imaging plaque vulnerability in different vascular beds with hybrid PET/MRI, 2) obtained more knowledge on processes leading to plaque destabilisation and clinical events. The ESR will visit King's College London (UK) for 5 months. Furthermore, the ESR will spend one month at Ttopstart in the final year of the project to write a grant application for a follow-up project. Qualifications: You are a Medical Doctor of have a Master Degree in Biomedical Sciences. Excellent command of the English language is essential. Command of the Dutch language is desirable to be able to communicate with patients. Experience: Experience with MRI, PET, and/or atherosclerosis is desirable. Knowledge & skills: Knowledge of cardiovascular disease, vascular biology, and inflammation is desirable. Good communication skills and analytical skills are essential. Abilities: Interpreting scientific literature and incorporation into project and understanding the research process are essential. Organising and prioritising own work and organising research within the project timetable are essential. Maintaining accurate and up to date records are essential. Attitude & disposition: Following abilities and dispositions are essential: Flexible and co-operative; Good relationships with staff and to communicate effectively; Self-motivated and hardworking; Enquiring, critical approach to work; Willingness to learn new skills; and Willing to travel and go on secondments. Other circumstances: Willingness to work flexibly in order to achieve project demands and targets as agreed with Supervisor is essential. Able to travel to workshops and for research collaboration in other EU countries with notice is essential. Post-Doctoral Fellowships on The Origin and Evolution of Life (18. PhD Researcher Groningen Graduate School of Law (3.